Quit Government job to help take care of the parnents and LOVING IT! But needed something to suppliment the funds. Oh, how I wish people could experience camping with a Teardrop.... 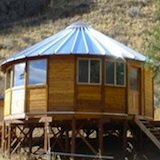 The ultimate way to camp/travel comfortably and, best of all, INEXPENSIVELY! My goal is to build around five/year and keep the price of each one to where not just the super-rich can enjoy the same wonderful experiences I have had with these increadible campers from the 30's and 40's. 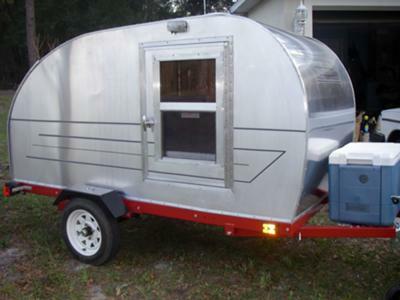 I built this "Benroy"-style Teardrop Camper is built using the typical Harbor Freight utility trailer. 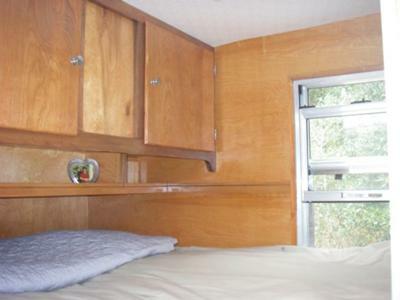 The "camper" part is built with cabinet-grade plywoods and clear hardwoods for the cabinets. The exterior is totally Aluminum with Stainless Steel fasteners. There is a 12V system that provides cabin lights and a roof vent with three-speed fan, two opening windows for LOTS of ventilation. Wiring available for sterio/DVD installation of your choice. 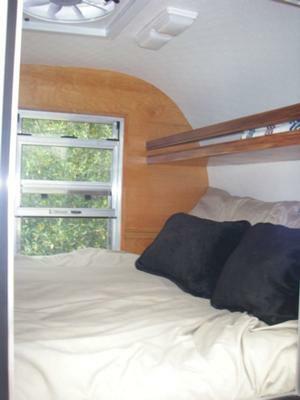 There is PLENTY of cabinet space for extended trips and weighs somewhere around 600lbs. A four-cylinder vehicle can pull it with no trouble at all. I use a 4-cylinder 1990 Volvo 240D and still get the same gas milage! 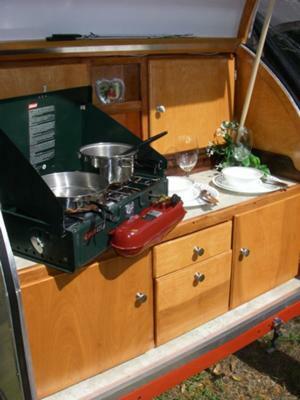 If you enjoy the outdoors, a Teardrop Camper is a wonderful step up from tent camping. It provides a dry, comfortable bed and a place to keep everything you need to take off whenever you're ready! I've had one for the past four year and have hit the entire East Coast and LOVE IT! 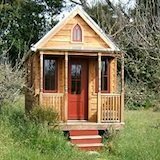 My goal is to build and sell one every two or three months to provide enough money to keep on enjoying building them. Compared to commercial brands that are available, these are a LOT of Teardrop for less than half the price. How to calculate shipping costs to the Midwest? Thanks for the complement :o) It's nice to know people can appreciate that it doesn't take a 40' Motorhome to travel comfortably! Although I can enjoy the 'finer things in life,' I have found they don't have to come in HUGE packages or cost a fortune to have or maintain - or USE! 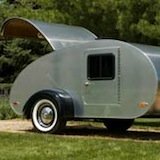 Teardrop campers have been around for a long time, but only recently begun to re-emerge from the ashes that have been left over of a glutonous life-style. I know everyone has their own tastes and their own styles, but I really wish everyone could find the enjoyment I have found with these campers! They are light-weight, easy to tow, easy on fuel consumption and terribly comfortable. I'm hoping to do a cross country trip this year sometime. Join in and write your own page! It's easy to do. How? 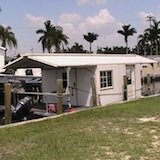 Simply click here to return to List Your Teardrop Camper for Sale.